Skiing and snowboarding are magical sports and that can change lives, supporting healthier decisions and experiences that can last a lifetime. There is no better time to fall in love with snow-covered mountains of Vermont than during a student's 5th grade year. To help our youth get to the hills, we offer participating fifth graders up to 88 days of skiing and riding at Vermont’s alpine and cross country resorts for just a $10 processing fee with the Fifth Grade Passport. A list of participating resorts for the 2018/19 season is noted below. “My daughter was in 5th grade last year and simply LOVED using the passport - as did our pocketbook. I recently mailed in my son's information who is in 5th grade this year so we can get to Vermont and get out in the fluffy white stuff! Again, many thanks for an excellent program!" - Mary Margaret Conners, New York. After May 1, 2019, 2018-19 passports will no longer be available for purchase as they are no longer valid for use after 5/1/2019. Please check back in the fall to purchase 2019-2020 passports. Please note, there is a $10 processing fee, orders are not complete until this fee is processed. This year, proceeds from the program will be donated to the Working Lands Enterprise Initiative, which protects and progresses the working landscape of Vermont by investing in agricultural and forestry based businesses & the Vermont Adaptive Ski & Sports Organization which empowers youth and adults with disabilities gain self-confidence and indepence by participating in adaptive sports programs or activities. When Will I Receive My Passport to Fun? Please note: All orders purchased by 11/14/18 are being processed and mailed out from our printing center the week of 11/19/18. Orders purchased after 11/14/18 could have up to a 2 week turn around time including ship time depending on where it is mailed to. Orders are typically fulfilled & mailed each day/to everyother day depending on what time of day the order is recieved. Orders received after 12pm on Fridays through Sunday are typically processed the beginning of the following week. When purchasing be sure to include proof of fifth-grade enrollment. Passport holders receive in the mail, a booklet containing coupons that are redeemed for lift tickets at participating alpine (downhill) resorts as well as coupons to participating cross-country centers to redeem for trail passes. The booklet contains 3 coupons for each participating alpine resort listed below. The number of coupons per cross-country centers vary, most offer one trail pass coupon with a few centers offering 3 coupons. Please note you do need the physical book in hand to use at the resort, Ski Vermont does not have a digital option for this program. Once received, please insert picture of child on inside cover of the booklet and complete required signatures. Present passport at ticket window/redemption location day of for ticket. Passport booklets must be in hand and presented at the resort ticket window to redeem the coupon for a lift ticket. Passport holders need to be accompanied by a ticket or pass holding adult and each adult may bring up to two Passport holders. Passports are valid Dec. 1 - May 1 excluding blackout dates which are listed below and on the back of each resort page in the booklet. This ticket/program may be subject to additional charges depending on specific resort’s ticketing technology. There are no residency requirements for the passport. For more information call (802) 223-2439 or inquire with the ticket office of the resort you plan to visit. 1 to 3 vouchers depending on center, please contact cross country center for blackout dates. The 2018-19 ski season begins the 19th year of enriching families’ winters with the 5th Grade Passport Program. 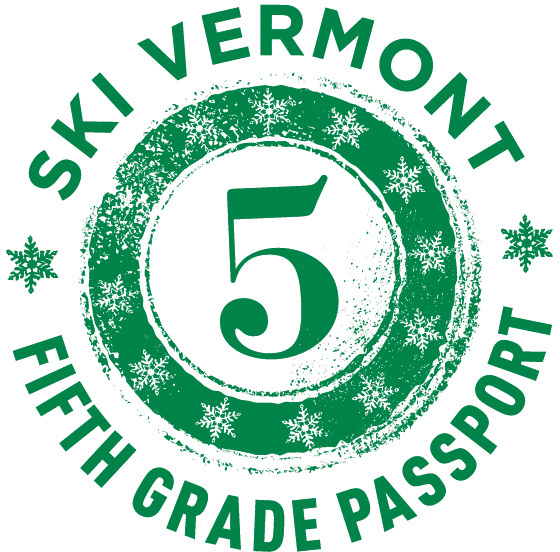 It also marks the 8th year in which the proceeds from the 5th Grade Passport will benefit the Vermont community. This year, proceeds from the program will be donated to the Working Lands Enterprise Initiative, which protects and progresses the working landscape of Vermont by investing in agricultural and forestry based businesses & the Vermont Adaptive Ski & Sports Organization which empowers youth and adults with disabilities gain self-confidence and indepence by participating in adaptive sports programs or activities.